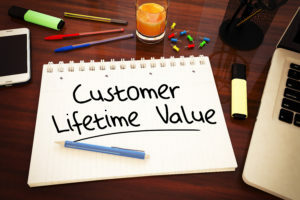 The customer lifetime value, or CLV, is one of the most important statistics in business. The CLV helps owners determine the revenue attributed to the entire relationship with a customer, present and future. It is a powerful statistic when looking at where to invest resources, especially when comparing the cost of marketing to an existing customer versus acquiring a new customer. Ultimately, it helps owners analyze marketing investments and new service offerings. While there are many ways to arrive at the CLV, in the vending and micro-market industry, it is easiest to look at the average revenue from a location for a given time period and then multiply that number by the years the location is expected to remain a customer (based on projections or the average customer retention rate). For example, let’s say the account averages $5,000 over 4 weeks. In a year, that is $60,000. If you retain a customer on average for 7 years, that location is worth $420,000 over the lifetime of the customer. A key statistic to compare with the CLV is the cost to acquire a new customer, or CAC. This number can be found by first determining the money spent on advertising to and acquiring new customers, such as those associated with digital marketing, sales people, e-mail marketing, etc., over a given time period. Divide the cost by the number of leads that became customers over that time period. Although the cost per customer is often higher than marketing to existing customers, this doesn’t mean marketing to new customers isn’t worth doing. That one digital marketing service delivered 8 times its cost in revenue. In the end, most business owners find that by using the CLV, they can invest a little and make a lot. Contact us for your digital marketing needs!